The AudioTron is a device ostensibly similar to the Dell Digital Audio Receiver, and I bought the AudioTron out of frustration with the Dell. I am pleased to report the AudioTron is superior in every way, and I have now sold my Dell with no regrets. The AudioTron is a device that lets you play music files (MP3s, WMAs and even WAVs) from your PC, anywhere in the house. (Well anywhere with a network connection). It has no storage itself, which makes it different from some other devices that have their own hard drives, as it reads the files directly from your PC (or PCs). The box looks like a piece of slimline audio equipment, in black, with a two-line green LCD display on the front. The buttons feel cheap (they are rubber in fact), but apart from this the box appears well built. The compact size is such that our JVC mini system, with speakers, manages to fit exactly on top of it. On the front there are large buttons for Power, Stop, Play, Pause, Next and Prev, plus smaller buttons for less used features. The two line LCD display is very clear and visible from across the room (unlike the Dell). To the right of the display is a large knob, which is used to navigate the menus. At the rear there are two phone connectors for HPNA networking, an ethernet socket for CAT5 wiring, analog audio sockets and a TOSLINK digital audio socket. There is no built-in amplifier (unlike the Dell) so you cannot just add speakers. The power supply is built-in which is good, I have way too many brick-like PSUs already. It comes with an infra-red remote control, but I have never used it. Almost everything is controlled by rotating and pushing in the large knob to the right of the LCD. The menus are intuitive and everything is easy to use. You can select your music by Title, Artist (the most used option by me), Album (which is selected by artist then album name and played in the original order), Genre (which I have never used), Net (for web radio stations) and Lists (for playlists). You can create and edit your playlists via the small buttons on the front panel, or via the web interface, but I do neither. Instead I create an M3U playlist on my PC, then copy that to the Music share and get the AudioTron to rescan to find it. I did have some trouble with my Dell-originated playlists as MusicMatch (which I created them in) puts a space after the filename on every line, but once I figured that out (it is now documented on the Turtle Beach FAQ page) and changed the paths to be in UNC format (\\server\d\music instead of d:\music) they worked great. Even with a gigantic selection of music (the device is limited to 30,000 files, a limit I am close to reaching) everything works very quickly. For even larger collections it is recommended to use multiple AudioTron devices. The player has a lot of other options which I have not used, but I do often press the Random button to shuffle up my playlist and Artist selections. The AudioTron scans for MP3s, WMAs and WAV files, and reads the tag information (if available) to extract the Artist, Album, Track name, and Genre information. It scans at about 1000 files a minute on my network, which is very good for this class of device (it runs Windows CE internally). The scanning occurs at hard power-on, and on-demand if you add some songs (or playlists) at a later date. You can play internet radio stations through the AudioTron, once you have configured them via the TurtleRadio web site. It can play Shoutcast and Windows Media formats (the latter available with the latest 3.0 firmware), but I have not managed to get it to play stations that are not explicitly listed on TurtleRadio, specifically KPLU and the BBC. This may be user error, to be honest, and not a product defect. There is a web server built-in to the AudioTron which you can use to select songs and edit playlists, as well as configure the device itself. You could use this to access the AudioTron wirelessly from a laptop or Windows CE device, but I have not used this feature in earnest - it is easier to walk up to the device and use the front panel for me. However if you were using this as a whole-house audio solution, the wireless option would be great. This UI is intelligent enough to handle large collections, unlike many (eg MusicMatch). By intelligent I mean for example it doesn't have a simple combo box for Artists, as that would get impossible to navigate with hundreds of items. Instead it uses multiple menus of selection, which makes it snappy to use even on huge collections. I connect to the internet at large via ADSL, plugged into the ADSL modem I have a LinkSys Etherfast Cable / DSL Router / Wireless AP. This acts as my firewall and DHCP server. Into that I have everything else, including my PCs, server, and the AudioTron itself. The AudioTron lives in the kitchen, which has a CAT5 socket on the wall. 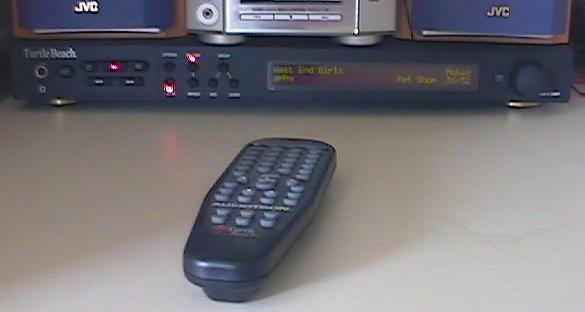 I have a JVC mini system connected to the AudioTron which is small enough to fit, with speakers, directly on top of the AudioTron (as seen in the photo above). The music files need to sit on a machine that is always on, and for me that is my Windows 2000 Server machine. This box's job is to run my domain and active directory accounts, and to be the repository of my music collection. Normally no-one is logged into the machine. This is not a problem for the AudioTron as it just searches the network for network shares, on all machines, and for music on the shares. You therefore don't have to run any specific software on your PC. I did have to create a user on my domain, give that user read access to the music shares, then tell the AudioTron the account and password, but this worked flawlessly. The Setup program will create the user account for you if you have a simple workgroup, but I have a fully fledged Windows domain so had to do a little manual setup. Not many people run domain controllers in their homes, as it is (probably correctly) considered overkill. When the AudioTron is powered up it searches your network for machines, and for shares on those machines according to a defined specification. It then recurses down suitably configured shares cataloging MP3s, WMAs and WAVs as it goes. It can index just over a thousand files a minute in my experience. It also reads M3U files for Playlists. There is a great support forum for the AudioTron which contains a wealth of information. It also has beta versions of the firmware, which you can try out if you are brave. I am not, but you can see that the device is actively being developed and has a keen user base. (Unlike the Dell DAR).